Make it easy to see clear detail and accurate colors as you work by using the Kenley Natural Daylight Lamp. Whether you work from home, perhaps as a designer or architect, or need good light for a hobby like reading, embroidery, crochet, puzzles or woodwork, this light will make work and play easier and more fun. This free standing lamp is a full spectrum light with a color temperature of 6400K, which is like having noon sunshine in your home. It shows true colors, unlike standard electric lights, and helps prevent eyestrain. Daylight has been proven to boost our natural energy levels, letting us work more effectively, feel less tired and be more alert. This Kenley Natural Daylight Lamp mimics daylight effectively so that you feel more alert and awake. It's an ideal way to start your day, particularly on gray winter days, or give you more energy into the evening. It can also help shift workers adjust. Lightweight and portable, the lamp has an adjustable swivel neck and a sturdy non-tip base. The replaceable 27W energy-saving bulb lasts for up to 8,000 hours. The lamp is 63in (160cm) tall and has a 69in (175cm) cable. LIKE NOON SUNSHINE Get the feel of full daylight even at night or on a dull day. This Kenley floor lamp has a color temperature of 6400K, which is as close to daylight as electric light gets. The energy saving bulb (included) lasts for up to 8,000 hours and uses just 27W of electricity. SEE TRUE COLORS Whether you are a professional graphic designer, a home sewer piecing a quilt or just someone who loves reading, this lighting will show you the true, clear colors of whatever you are working on or looking at. 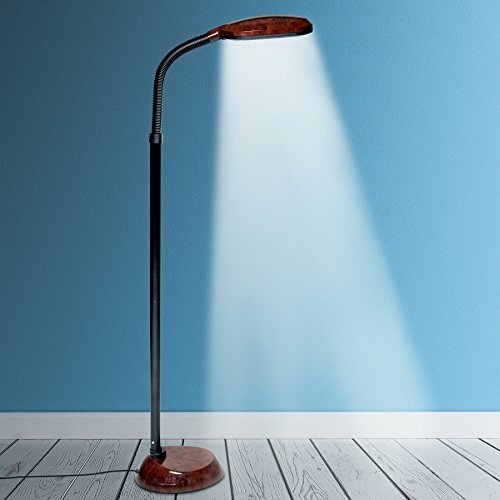 No need to wait for sunlight to do your work with this Kenley task lamp you can work any time. REDUCE TIREDNESS There is nothing like natural light for reducing tiredness and helping you cope with dim winter light apart from the Kenley Daylight Lamp, that is! As this lamp imitates noon sunshine, it gives your body a boost of energy which can help you start the day well, work later at night, or handle working shifts. VERSATILE AND STYLISH LAMP Designed to suit any decor, this modern lamp is ideal for office, living room and hobby use. Lightweight and portable, the lamp is 63in (160cm) tall and has an adjustable swivel neck. A sturdy base prevents tipping and a 69in (175cm) cable lets you place the lamp wherever you need it. THE PERFECT GIFT You know someone who is straining their eyes trying to work in poor lighting. Transform their experience with a brand new lamp, and make their hobby or work pleasant and relaxing. This Kenley lamp is the ideal gift for anyone who loves to read, do puzzles, paint, knit, sew or do other work with their hands. If you have any questions about this product by Kenley, contact us by completing and submitting the form below. If you are looking for a specif part number, please include it with your message.